Eve the Australian Cattle Dog. The original art by Canadian cartoonist Ron Leishman. Order an Australian Cattle Dog t-shirt with Eve in full color. Check it out. Unlike most breeds that have a distant, fuzzy background, the Australian Cattle Dog (ACD) is a manufactured breed. Early European settlers in Australia took their herding dogs with them. The heat, dust and huge distances soon made weather back home look like a day at the park. It was clear that a tougher dog was needed - a piece of canine gristle capable of dealing with these conditions. The ranchers cast their eyes about and didn't have to look far. The Aborigines had a canine living with them called the Dingo. The Dingo was a mid-sized wild dog that the Aborigines found, domesticated, and loved dearly. It is written in early journals that the Aborigines even ate the dog's fleas in a colorful method of parasite control that preceded Advantage by a few hundred years. Anyway, early observers of this wild dog turned pet found them to be remarkably intelligent and an interesting mix of independence and devotion. The die was cast. The imported herding dogs were crossed with the Dingo with a few other crosses including Bull Terrier and Dalmatian. Before we explore the results, let's take a short side trip into the world of psychiatry. What I would like to suggest is that the breed that resulted from the cross of dogs and Dingos, which must have seemed like a good idea at the time, has left us with a handsome, smallish dog that suffers from three independent personalities. In fact, what we have here is a psychiatric nightmare worthy of a new movie - The Three Faces of the Australian Cattle Dog. The first time an ACD came into my consciousness was at a rodeo in Jackson Hole, Wyoming. There was a gray blur that tore into the ring to harass a gigantic bull, that had summarily tossed a young cowboy on his head, out of the arena. The bull exited with the smallish dog hanging off his left ankle. Over the course of the evening, I became more interested in this dog than the rodeo events. The gray blur, a thirty pound dog with a speckled blue and white coat, prick ears, and a lovely blaze, was in firm control of two thousand pound beasts flinging snot from their noses the size of toy poodles. This dynamo dog ducked under a dozen cow kicks. After one well-aimed kick connected and tossed him fifteen feet, he bounced up like a rubber dog and came back for more. 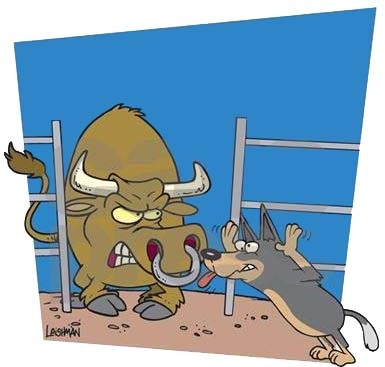 When any bull refused to exit stage left and moved into the arena for an encore, the dog took aim on the drippy snoot and made it clear with some well aimed snaps that that was a bad choice. This dog was high drive, fearless, fast, and working seemingly by himself. Subsequent study of the ACD has shown that this rodeo dog was not a unique individual. In its herding personality, this lightweight prize fighter of a dog can move big mobs of cattle in terrible terrain "Dense scrub?" the ACD seems to say. "Bring it on!" It is important to note that many owners of other herding breeds would never allow their dog near a cow, given the cow's capacity to knock their lights out. However, a well-trained ACD with its uncanny ability to dodge and feint flying hooves can take the place of several ranch hands when the chores call for moving the live stock. He is the assertive canine gristle the early Australian settlers were hoping for. The second personality of the ACD is an about-face from rodeo dog. Kiss the tough dog good bye. Say hello to a perky, intelligent dog with a highly developed sense of humor. The second face can be accurately called the Boy or Girl Scout personality. Given adequate exercise - both physical and mental - this is the perfect companion. It is easy to imagine this dog with three toes in the air reciting the pledge, "Be Prepared…"
These pups never leave their owner's side. With any movement they are on their feet asking, "Where are we going? Is it an adventure for us? I am sensing fun. Is there going to be fun? Are we taking my ball? Ball. Ball. Can I grab your hand and help you get to the door? Should we take the Frisbee too? Oh, I love to go places with you. I will need to herd all those cattle going by from the back of the car. Oh, I love to go places with you." If they are getting adequate exercise - mental and physical (I know I am repeating myself but a bored ACD is not a good ACD) - ACDs are not obsessive in their demands. Generally, they can also keep themselves busy with a bone, playing with another dog for quite some time, or working on their merit badges. This is a sharp contrast to other herding dogs that obsessively ask their owners to play. This ACD specializes in grinning and inventing sophisticated games. Gone is the serious worker in the pasture or arena. Give an ACD a soccer ball, a baby pool and get your video camera. Chances are good you'll get some good footage for America's Funniest Animals. ACDs love to embarrass their humans in a charming way. For example, the down command is interpreted as a flop on the backside with feet flailing in the air. The ACD in the second personality is always two steps ahead and looking for creative ways to get the job done. The ACD uses three primary communication tools very effectively. The first - the famous nose bonk in which the dog uses its nose like a woodpecker to prod his owner - is very effective to move the owner in some direction, generally toward the ball. Secondly, the ACD is capable of using "The Eye" to take over their owners' thoughts in the same vein as the Border Collie. When these two strategies fail to bring the desired result, this pup also has a wide range of noises from bark to yodel to communicate their desires. Like any ACD, Tasha knows where all of her balls are kept. I also have a pair of shoes that I only wear when we go out on walks. And she has a bell that she rings when she has to go out. This one evening she was pestering and pestering me to go play. She went over to the table that her ball was sitting on, pointed her nose up and did her little snort. In a playful mood, I kept asking her, "What do you want." She circled the table and pointed up on top where she knew the ball was. I kept repeating my question. She started snorting and woofing. Finally, she seemed to decide she would have to spell it out for me. She walked over to my shoes, woofed at them and gave them a nose bonk, went over to the bell and kicked it, and then she returned to the table, pointed with the ball, woofed at me, and shook her head at the ball. How clear was that? Tristan loves ice cream and is allowed to lick the lids. Last night, he cleaned his lid after chasing it across the room. He came over to me to ask for more. I asked him, "Where's your lid?" He ran to get it and handed it back to me. I gave him a bit more. He finished that and brought the lid back. Who could ask for more - an attentive, funny dog with good communication and problem solving skills? Everything would be perfect if the story stopped there. But sometimes Personality Two fades into Personality Three. Sometimes the first personality - the driven herding dog - and the second personality - the charming companion dog - collide. The result is the disturbing third face of the ACD. A resistant attitude that results in a dog that considers a command and says, "Oh yeah? What's in it for me?" A demand for gratification such as, "Hey, here is my cow hoof. Fill it with peanut butter now or else." Destructiveness with a sneaky edge such as Brenda M's dog that chewed her glasses and hid them in the bed under the covers. Nipping. Human heels. Horse heels. Anything. Shyness and nervousness that reveal those Dingo genes. At its worst, a natural suspiciousness of strangers that elevates to aggression. The third face may remain dormant and never appear in some ACDs. Good training and socialization may limit its appearance. But if it does rear its head, bring out the Prozac and dose both you and the dog. Better yet, be careful to purchase a pup from lines in which the third personality has never appeared. Besides, two personalities are enough for any dog. Do you have an advanced degree in psychology or psychiatry? Do you work part time or not at all? Are you willing to participate in flyball, agility, and obedience classes (all at once)? Are you willing to play ball or Frisbee at least an hour a day? Are you willing to match wits with a dog whose wheels never stop turning? Most importantly, are you willing to deal with two and perhaps three personalities and their specific demands? If you have answered yes to all of these questions, you are a candidate to partner with one of the most interesting and occasionally challenging breeds. References: In writing this article, I drew from three sources. The Complete Cattle Dog by John and Mary Holmes is an excellent book. The website, www.cattledog.com, provided a wealth of anecdotes. And lastly, those ACD owners who contacted me with stories were very helpful, and I am very grateful to you.